Ealing became the first side to complete the double over Doncaster Knights after posting a 29-21 win in their top-four Championship clash at Castle Park. The big-spending London side cut third-placed Knights lead over the chasing pack to just four points. Five minutes from time Knights looked to be on course to open up an 11-point lead on fourth-placed Ealing when replacement Aaron Carpenter celebrated his debut with a try. Carpenter, who joined Knights from the defunct London Welsh, ploughed over from close range to level the scores at 19-19 after centre Lloyd Hayes had been stopped just short. Dougie Flockhart, whose previous conversion attempt hit the far post ,added the extras to edge Knights into the lead for the first time but their joy was to turn into despair. Their defence opened up like the biblical parting of the Red Sea as fly-half Aaron Penberthy sent big centre Joe Munro over from a scrum on the Doncaster 22 on 79 minutes. To rub salt into the wounds, Penberthy dropped a stoppage-time drop goal to leave them empty-handed as had been the case in the 27-14 defeat at Vallis Way in October. It capped an impressive display by the No 10 who tested Knights with a series of high hanging kicks and orchestrated wave after wave of high-speed attacks in a dominant first half display along with half-back partner Charles James-Carter. Knights, who had to reshuffle after losing centre Mat Clark after just a couple of minutes, somehow managed to deny the slick moving visitors a first half try with a defensive stint that did director of rugby Clive Griffiths, a former Wales defence coach, proud. But there was little of the attacking flare which had produced five tries in the first 40 minutes at Bedford a week earlier, and they had to settle for a penalty by Flockhart – the pick of their back division along with full-back Paul Jarvis. They had missed dual-reg second-rower Glen Young in the lineouts and their tactical kicking had been poor. When Penberthy rewarded a bright start to the second half with a fourth penalty on 47 following the sin-binning of Hayes, to make it 12-3 it was starting to look ominous for Knights. An opportunist close-range try by scrum-half Michael Heaney served to raise their spirits. But they ended the third quarter trailing 19-8 after Ealing finally got over the line with second-rower Barney Maddison touching down for a converted try after backing up a 30 metre break from an interception by No 8 Mark Bright. They weren’t about to throw in the towel, however, and two penalties by Flockhart cut the deficit to five points and with Ealing having a man in the sin-bin, it was game-on with 12 minutes to go. But in the final analysis, Knights came up just short against formidable opponents. 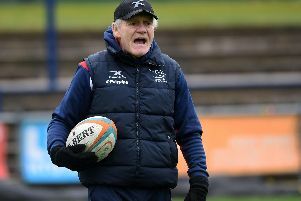 Doncaster Knights: Jarvis, Flockhart, Hayes, Clark, Lewis, Cusack, Heaney; List, Hunter, John, Challinor, Nolan, Ram, Hills, Williams. Rep: Bergmanas, Allen, Quigley, Makaafi, Carpenter, Edgerley, Scanlon. Ealing: Daniels, Mantella, Jones, Munro, Cordy-Redden, Penberthy, James-Carter; Davis, Walker, Thiede, Jones, Maddison, York, Smid, Bright. Rep: Cornish, Saenz Lancuba, Rodman, Preocanin, Ryan, Walker, Harries.